As I sit here writing this review, a cold front is coming through and changing our weather here in New York. The warm fall we’ve had is now turning much colder, and the news has started using the term “Polar Vortex” a whole lot lately! I don’t really mind the cold weather itself, but I’m not a fan of how dry the air gets in our house every winter. We’ve been using humidifiers for years in every room in the house in order to keep our house comfortable in the harsh winter months. We’ve cycled through many brands and styles of humidifiers over the years and have only been sort of satisfied with each of them. I’m happy to say that our search for the perfect humidifier is finally over, thanks to Luma Comfort. We’ve been using a Luma Comfort air purifier in our home for a while now and we’ve been extremely happy with it. 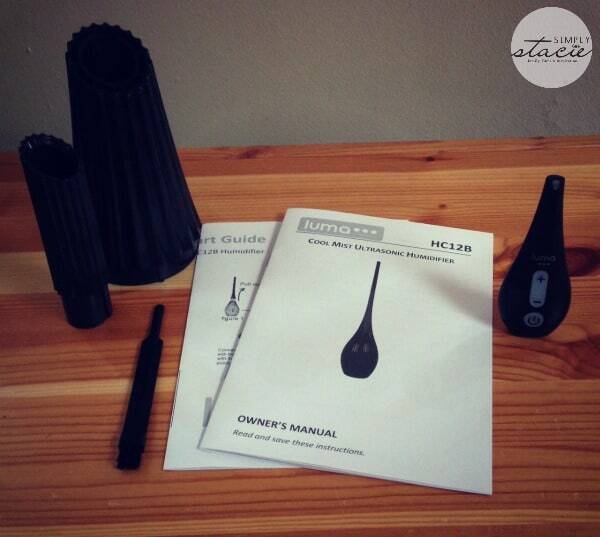 We love the style of the piece, the ease of use, and what it does for the quality of the air in our home. 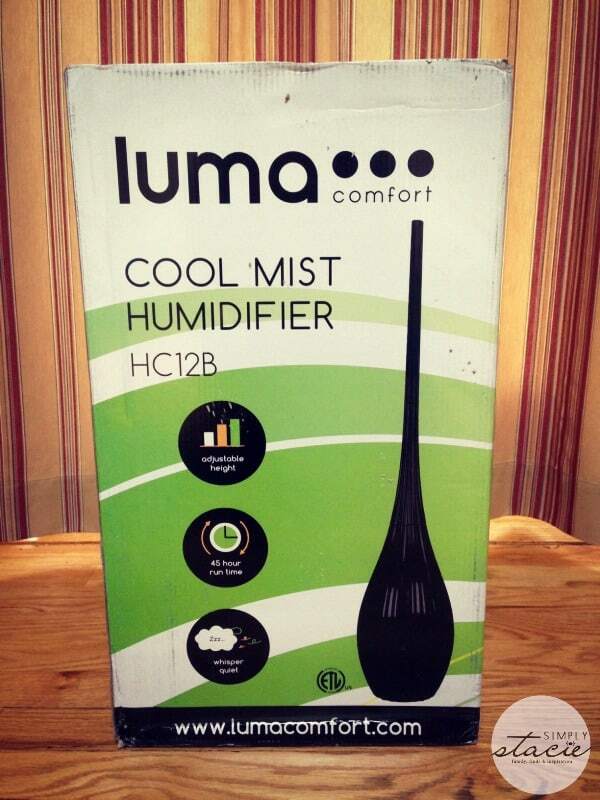 I was impressed with Luma Comfort as a company as well as with the range of products they offer and was thrilled to be asked to review their HC12B Ultrasonic Cool Mist Humidifier. When the box arrived at my home, I was able to get the humidifier up and running in just a matter of minutes. There’s nothing complicated about it – you just simply have to decide if you want a long or short profile, fill the tank with water, and turn it on! I chose the long neck for this review, as I thought it looked nice in my living room. The sleek design of this unit is perfect for small spaces, and I like the way this piece blends in with my furniture. This piece comes with a remote that makes it easy to turn the unit on and off, and also change the mist setting. What’s wonderful about this humidifier is that it lives up to its promise of being “whisper quiet” – something that a lot of other brands claim to be, but I have not found one to actually live up to this claim until now. You’ll hear in the video just how quiet this unit is. If you’re in the market for a humidifier, I would highly recommend this one. My husband and I are planning on replacing the other humidifiers in our home with this style as we gear up for another long winter. You can learn more about this unit, and where to buy it, on the Luma Comfort site. This unit is currently selling for $139.99 on Amazon.com. You can also connect with Luma Comfort on Facebook, Twitter, and YouTube. This is a very attractive looking humidifier, and to be honest I would buy this based solely on the way it looks. The fact that it’s an energy saver is definitely a plus. Thank you for sharing this review. I’ve been looking for a quiet one with no luck. Thanks so much for this review! how unusual to find a machine that actually looks so good (Dyson is another). I’m afraid that I have to use a dehumidifier in my basement flat and it’s a big squarish machine and looks no where near as attractive. A humidifier is great. I love this design and the fact that it also has a remote! that is awesome! This is such a unique design! I’d love to have this in my bedroom, especially when I’m sick. I didn’t even realize it was a humidifier. Very unique design and would bring a decorative touch. It is getting colder and the air dryer. Humidifiers are big helps this time of year. I am always looking for a good humidifier too, and I like how unobtrusive this one is! my house gets so dry in the winter I really should get a humidifier and I like that this one looks nothing like one! What an interesting design. 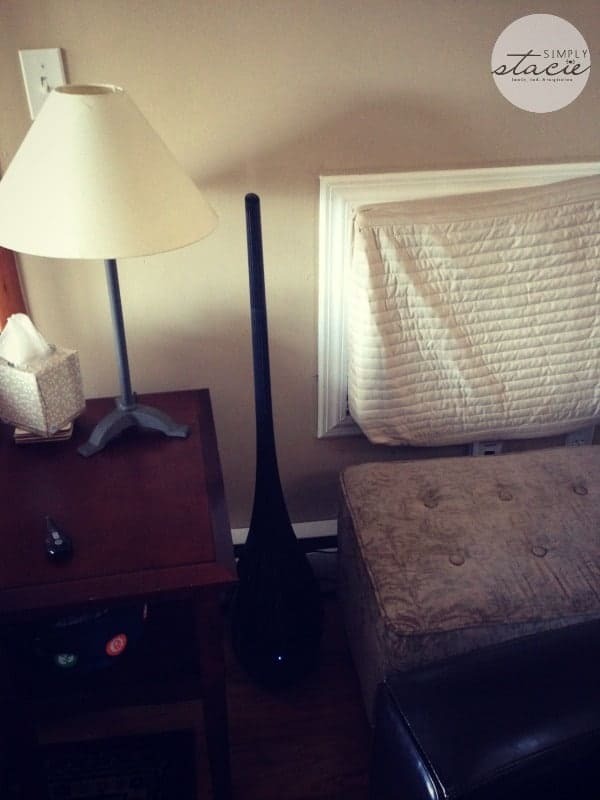 Wouldnt think it was a humidifier at first glance. We need a humidifier in our house. I love the look of this one! I’ve seen these before and have thought it would be a great addition to our home. In Canada the cold weather makes for a very dry air quality, This leaves our lips dry and cracking. I wear lip balm all the time but I think we need this. Wow, that is a pretty neat looking humidifier!! I bought one today because it is so dry here in Alberta and sometimes I wake up and I can’t breathe because my throat is so rough! I wish I would have looked into Luma, I wonder if they sell them in Canada too!